Addresses joint stiffness of the elbow by using a low load, prolonged stretch modality. It can be used to treat both flexion and extension joint stiffness with one unit. Easy to set and release tension. Unique Quick-straps allow for easy application and removal, and the self-wicking lining absorbs perspiration dampness. The ROM limiters also allow it to be used as a static progressive splint. Weight: 15 oz. Padded cover available. Specify right or left. For single patient use only. Measure biceps circumference. 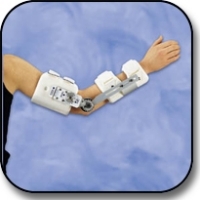 Extend patient\'s arm to end range before measuring. #4129CL - Small/Medium, 9\" - 12\"
#4129CR - Small/ Medium, 9\" - 12\"